being a confirmed roadie has its benefits, one of which is a form of laziness. by this i mean not to imply that the training schedule has been unceremoniously shunned for yet another weekend, in favour of slouching on the sofa in front of a cappuccino and a sticky bun (sticky buns don't get enough airplay these days), but concern over certain small degrees require little by way of serious consideration. i am thinking here specifically of tyres; rumour has it that a 25c tyre width would run quicker than a 23, though that seems not to be borne out by a quick look through the pro peloton. granted many are on tubulars, but they're still mostly 23s. so when clicking online to replace those worn out hoops of rubber (which you really should have taken care of about a month ago; there's that laziness again), it becomes far less about what width, much more about what colour would go nicely with my colnago?. you can presumably see the potential for roadie laziness in the above. alter the scenery slightly to encompass the great outdoors off-road (and i do not mean the darkside), and choices now have to be made. several years ago, those lovely people at chris king's in portland, oregon were kind enough to send over a pair of chris king wheels; dt swiss rims, wheelsmith spokes, and the most utterly gorgeous pink chris king cyclocross hubs. the thinking at the time was that our (still) deteriorating roads, would be more easily traversable on wheels/hubs specifically designed for rougher than a billiard table. perhaps sacreligiously, these wheels have been shod with both michelin pro-race (blue, since you ask) and schwalbe ultremos, and have spent the majority of their life fastened to a colnago c40. you can imagine their confusion. however, given that the ibis hakkalugi cyclocross bike is on a relatively lengthy period of testing, and has become a sincere favourite of thewashingmachinepost bikeshed, the opportunity to restore a modicum of glory to the chris king wheels was too enticing to pass up. the build-kit accompanying the ibis frame included a very nice pair of easton factory wheels shod with michelin cross tyres. 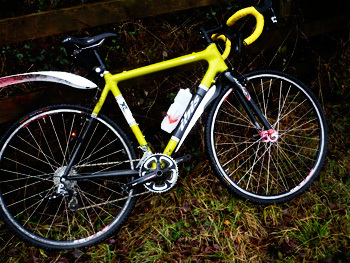 if this test was to encompass a wider landscape, i thought it a good idea to fit a pair of mud-specific cross tyres from continental, given how much i have enjoyed the four seasons contis on the cielo. continental uk very kindly supplied a pair of speed king 700x35c that i might indulge my whim on your behalf. sore thumbs have resulted on more than one occasion when previously attempting to fit continental tyres, though usually only at the brand new stage, however, most of those have been folders. the speed kings received were of the wired variety, 70g heavier than their folding brethren, but also several pounds less when it comes to using one's flexible friend to pay. though this is rotating weight and thus worthy of serious consideration perhaps if you are competition oriented. however, in my case, this is completely surplus to requirements. there are obviously one or two other factors for thought when choosing one or t'other, but i was more than happy with the wired version (often a smidgeon tougher too). 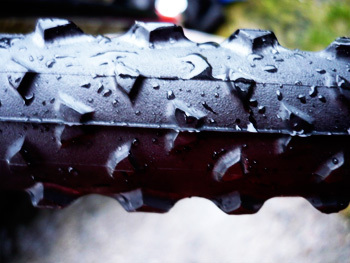 the tread pattern is sparse, with small, widely spaced knobbly bits along the centre of the tyre and differently shaped, but similarly sized bobbles along the edge. pressures advised by continental are 58psi (4 bar) up to a maximum of 85psi (6 bar), the lower one being suggested as the ideal for scrabbling around in the mud and grass. always willing to take the advice of my betters, i inflated both to as near the lower figure as i could, given that the ground around here is soft underfoot. that, it turned out, was perhaps a bit of an understatement; i had waterproof clothing to test simultaneously, and the very heavy rainshowers on saturday seemed ideal on both counts. don't anyone tell me i cannot suffer for my art. bridgend woods has, over the last few years, been developed by islay estates to be an area for recreational purposes, both walking and cycling. this has resulted in a clearly marked path network, though these paths are unpaved, and after several days of considerable snowfall over christmas and subsequent persistent rain, they have consolidated themselves under the heading of ethnic; a euphemism for muddy puddles. though essentially flat, one or two idyllic tree-lined lanes head both upwards and downwards, with very soft gloopy, grassy strips down the middle. and where the rivers of rain consolidate at the junction between downhill and flat, the delta is soft, mushy and of variable depth. 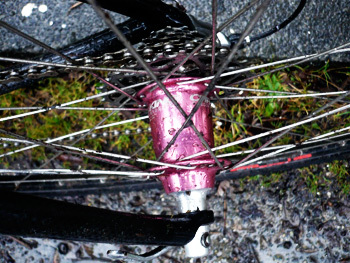 despite bike handling skills that would be despised by a four year-old, i got both person and bicycles very wet and muddy at 58psi to gauge the efficacy of both rubber and the wheely bits to which they were attached. such a low tyre pressure does not necessarily favour travel on metalled roads, though if not in a particular hurry, this matters not a lot. those knobbles create a very impressive buzzing noise at cruising speed, added to and enhanced by that trademark chris king buzz from the rear wheel ring-drive when freewheeling. i will forgive you for a smidgeon of suspicion over my impression of having replaced the eastons with the kings, because had i read this from someone else, i too would have held the writer culpable. and it's not just because the hubs are pink (well, not entirely). i have averred that riding an all chris king equipped cielo is akin to gliding; popping the ck wheels on the ibis has brought a similar sensation, along with the great big indefinable. these 32 spoke three-cross wheels are fabulous; ain't no bout adoubt it. the tyres also excelled at their job. i've never raced cyclocross, but i'd imagine that the better and more competitive chaps and chapesses find the quicker line around a circuit and stick to it like glue. that may have them reach the finish line more quickly than their competitors, but it doesn't strike me as the most pernicious way to test a pair of cyclocross tyres. i was therefore able to capitalise on my incompetence and churn through probably the most scurrilous sections of recreational trails available to the velocipedinally inclined. climbing a substantial length of trail decorated with at least two rivers of water heading in a contradictory trajectory, my riding along the muddy central reservation resulted in very few periods of lost traction. i'd be fibbing if i said the rear wheel did not slip occasionally, but far less often than the conditions would have suggested. similarly, riding downhill at speeds well in excess of my ability to control gravitational pull, incurred very few squiffy moments. such technical activity accompanied by soaking rain deserves a reward of sorts, preferably one that had a soya milky froth on the top. 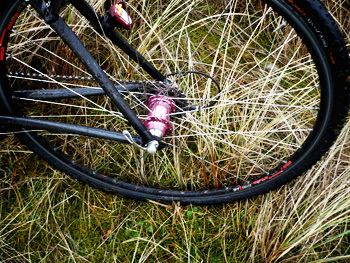 between bridgend and bruichladdich is a long stretch of soft, wet grass that we like to refer to as uiskentuie strand, ideal for continued evaluation of cyclocross tyres still running at 58psi. about two thirds of the way down, on the opposite side of the road is a gravelly track, at one time considered a road, but now essentially defunct for this purpose and thus no longer under any sort of maintenance agreement. flipping off the grass, across the road and onto this 1km of unkempt, potholed and sheep traversed track, i challenged those handling skills yet again. so far, so good, but assuming that the hakkalugi is to fulfil the ideal of its californian creator, scot nicol, it ought to be just as happy riding on road, keeping up with the joneses, differentiated perhaps only by its cantilever brakes. this is far less of a trial for the chris king wheels which, till this point, have inhabited this environment since arrival on islay some years back. saturday was too muddy, overcast and rained upon for this to be of great concern, but riding the ibis for the sunday ride in the company of the caliper braked, skinny tyred pelotonese would surely be a better test of their metal? 58psi is hardly the level of inflation that would allow one's composure to remain struggle free, so on sunday morning (featuring gale force winds with 60kph+ gusts), the pressure was increased to near the maximum recommended, creating an even more distinct whiny buzz on the road; not at all unpleasant. i cannot pretend, and you would find it hard to believe if i said so, that it was as easy to maintain the speed achievable by my compatriots, but considering the mess of the roads around loch gorm, i benefited in other ways; mostly comfort. even on the smoother sections of tarmac, i did not have to work myself into too much of a lather to maintain pace. as comprehensive a test of tyres and wheels as it is in my power to conduct. the combination of both have made a ruddy good cyclocross bike into an object of desire, and i am now eager for another atrocious day like saturday to do it all again. given that this is the inner hebrides, i doubt i'll have to wait too long. 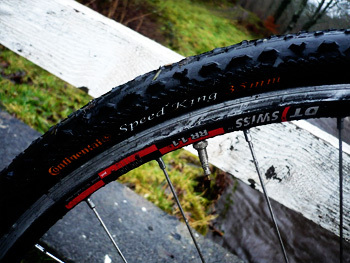 continental speed king cyclocross tyres are available in wired version at £16.95 each or folding at £24.95 each. 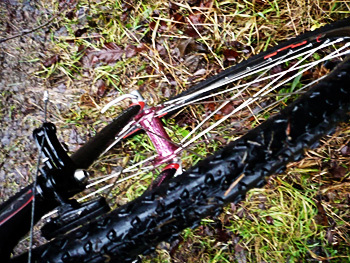 these are recommended as all-round cross tyres also particularly adept in the mud. a chris king factory wheelset is, to my knowledge, unavailable in the uk, but costs around $600. in the uk, you might wish to contact strada wheels to have a pair built on chris king hubs.